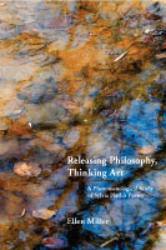 Title: Releasing Philosophy, Thinking Art: A Phenomenological Study of Sylvia Plath's Poetry Author: Ellen Miller Imprint: The Davies Group, Publishers soft cover 254 pp. USD 24.00 ISBN 978-1888570335 April 2009 Releasing Philosophy, Thinking Art, the first full-length philosophical examination of Sylvia Plath’s poetry, claims that art and philosophy need each other and have much to say to one another about questions that overlap each medium. While Releasing Philosophy, Thinking Art is indebted to the continental philosophical tradition, the methodology and questions raised will also appeal to philosophers in the analytic tradition. The author applies Heidegger, Merleau-Ponty and Irigaray’s writings to this interesting poet whose works help address key questions in contemporary philosophy. The book will be of interest to those concerned with literature, art criticism, women’s studies, religious studies, and the general reader interested in learning more about Plath’s poetry. Contents Introduction Chapter 1: "Mystic" Grundriss; Breath; The Poem as a Visual Opening; Silences of Depth; Multiple Meanings of the Heart Chapter 2: "Ariel" The Sacramental Value of Colors; The Turning; Performing the Feminine; Bodies in Poetry, Bodies in the World; White as Lighting and Depth; In Her Own Voice; Striking a Balance Chapter 3: "The Moon and the Yew Tree" Poetic Absence and Light; Opening onto the Feminine Body; Other Ways of Listening and Seeing the Poem; In the Name of the Mother; Inside the Suicidal Body; Facing the Other; Engendering Sexes Chapter 4: "The Arrival of the Bee Box" Arriving; Tensions and Resistance; The Blond Colonnades; Swarms: Plath’s Stereotypes; Plath and Racial Imagery; Plath’s Racism? Beyond the Bee Box; Letting Be(e); Appropriation and Releasement; The Box is Only Temporary Epilogue: Performing the Spiritual for Plath, Heidegger, and Merleau-Ponty Notes Bibliography Index Review "Releasing Philosophy, Thinking Art is a landmark book that demonstrates a new way to do philosophy with the help of art and literary criticism, which enlightens both without reducing either to the other. Her method, a body hermeneutics, develops Heidegger’s famous hermeneutic studies of individual poems, especially by Hölderlin, as a central way of doing philosophy itself. It equally develops Merleau-Ponty’s main contribution to philosophy, that distinctive and multiple modes of body consciousness can be used to better understand philosophy, art and the world in general. Because its style elegantly mirrors its content and methodology, the book dances with sensitivity and rigor echoing Plath’s own impassioned figures and insightful pathways." —Samuel B Mallin, Professor of Philosophy, York University, author of Merleau-Ponty’s Philosophy, 1979 and Art Line Thought, 1996. Author Ellen Miller is an Associate Professor in the Department of Philosophy and Religion Studies at Rowan University. She is also a member of the Honors and Women’s Studies faculty. She has published articles in phenomenology, aesthetics, feminist philosophy and ethics.